By the time Klaus Schulze released his debut solo album Irrlicht in 1972, he had already been in what would prove to be two of the most important, innovative and influential Krautrock bands, Tangerine Dream and Ash Ra Tempel. Both groups would write their names into the history books. However, being in a band didn’t seem suit Klaus Schulze. He found that the endless discussions got in the way of the important thing, making music. He wanted to make music, not talk about it. Klaus’ approach was to let the music flow through him. Other musicians seemed to want to discuss every aspect of the music. Meanwhile, Klaus wanted to improvise. It was frustrating, and stifling Klaus’ creativity. As a solo artist, he wouldn’t have to put up with the endless pointless discussions. So Klaus left Ash Ra Tempel, and decided to pursue a solo career. When Klaus embarked upon his solo career, he was something of a free spirit. He was determined to make music that was unique. Klaus couldn’t point at an artist, and say: “that’s the type of music I want to make.” While Klaus was aware of minimalist composers Terry Riley and Steve Reich, this wasn’t the type of music he was considering making. They did share some things in common, the concepts of repetition, phrasing and sequencing. Apart from that, Klaus was heading in a different direction. This meant Klaus was never going to be accused of following in someone’s footsteps. Musically, he had a blank canvas to work with. His palette of sounds were unlike other musicians. When he began recording Irrlicht in April 1972, Klaus musical owned an amplifier that wasn’t working; a guitar; percussion; zither; an organ; a cheap microphone and a cassette recorder. The cassette recorder and microphone he used to tape the famous Freie Universitat Berlin orchestra. Before the recording of Irrlicht, Klaus had gone along to watch the Colloquium Musica Orchestra rehearse. As he stood and watched, he told the conductor “I like what you are doing, but could you do something different for me for half an hour?” With that, the bemused conductor asked “what would you like to have?” Klaus responded, with: “I don’t care, just play anything. I just want the sound. I’m going to play the tape backwards.” When Klaus returned half an hour later, his tape was ready and an integral part of Irrlicht was complete. This recording Klaus would alter with filters. Now, it was a case of bringing everything together. However, before Klaus did this, he would modify some of his equipment. Klaus set about modifying the broken amplifier. He modified it, so that when he turned the volume up it caused feedback, tremolo and chirping sounds. The organ was modified by Klaus so that it no longer sounded like an organ. Along with his microphone and cassette recorder, Klaus set about recording his debut album, Irrlicht. Incredibly, Klaus didn’t even a synth. While other artists owned banks of expensive synths, Klaus created an album that sounds as if it’s made entirely by an array of synths. Instead, Irrlicht, with its cosmic sound and ambient drones was a synth free zone. 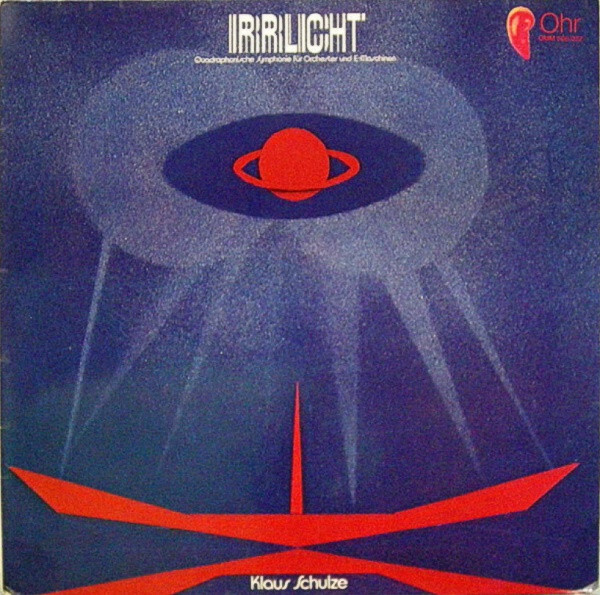 Instead, Irrlicht was more like an album of Musique Concrète. Klaus manipulated tapes, adding filters, delay, echo and an array of effects. The result was a trio of cinematic tracks that sounded like the soundtrack to an early seventies sci-fi film. It was released in August 1973 as Irrlicht. While Irrlicht was well received by some critics, many critics failed to realise how important an influence Klaus Schulze have on music. He was a musical pioneer who would become a leading light of the Krautrock and Berlin School movements. However, very few German record buyers were aware of either movement. That was the case throughout Europe. Apart from a few discerning critics and record buyers, neither albums of Krautrock nor Berlin School found an audience. That would come much later. 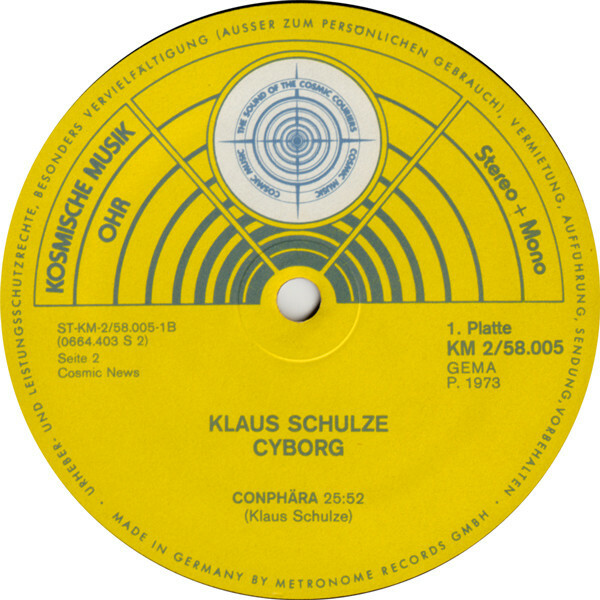 By then, Klaus Schulze would’ve released several albums, including his sophomore album Cyborg, which was recently remastered and reissued by MIG as a double album. When Klaus began work on Cyborg, he was still hampered by the equipment he owned. While other musicians owned banks of expensive synths, Klaus’ only synth was a twitter synth, the VCS 3. This was progress, as Klaus didn’t use synths on Irrlicht. To the VCS 3, Klaus added the organ that featured on Irrlicht, percussion and his Revox tape machine. Again, this played an important part in Cyborg’s sound. Just like Irrlicht. Klaus would use tapes of an orchestra. Klaus had befriended music students at Colluquim Musica Orchestra. They had recorded some rehearsals at the recording studio in Berlin University. These tapes were important for several reasons. The first was that Klaus wasn’t making much money out of music. That’s despite recording albums with Tangerine Dream, Ash Ra Tempel and releasing his debut album Irrlicht. These albums hadn’t been particularly successful. So the only time Klaus made money through music, was when he played live. Other times, Klaus had to resort to odd jobs to make ends meet. He delivered telegrams to augment his income. Given his financial situation, Klaus like many Krautrock and Berlin School bands and musicians, couldn’t afford expensive equipment. With the cupboard bare, Klaus again used the tapes to augment his array of instruments. The tapes Klaus had been given by the music students at Colluquim Musica Orchestra, he decided to splice with a razor blade, and add to the four lengthy tracks that became Cyborg. This wasn’t easy and took time, patience and practice. However, by the time he came to record Cybord, Klaus was skilled at cutting up the tapes and rejoining them. Later, Klaus described this as “adding spice.” However, adding spice took time. Recording of Cyborg began in February 1973, and the sessions continued until July 1973. During that five month period, Klaus played organ, the VCS 3 synth, percussion and added vocals. He also took charge of editing the tapes provided by the Colluquim Musica Orchestra. They’re billed as the Cosmic Orchestra on Cyborg, which by what became Cyborg was completed. During the recording sessions, Klaus had recorded four lengthy tracks. They ranged from twenty-three to twenty-six minutes. Given the limitations of vinyl, there was no way that the music would fit onto one album. So a decision was made that Cyborg would be a double album. This would prove expensive for everyone involved. It wasn’t just that a double album was more expensive to manufacture. Artists receive a reduced royalty rate for a double album. So often, artists avoided releasing a double album. Not Klaus Schulze. He must have realised that he had recorded a truly ambitious and groundbreaking, Cyborg. It found Klaus experimenting, pushing musical boundaries and fusing disparate musical genres. This time Klaus, was taking further what he began on Irrlicht. However, how would critics react? When critics heard Cyborg, many critics realised the importance of the album. They heaped praise and critical acclaim on Cyborg. One critic from the music magazine Flash, enthusiastically described Cyborg as “cosmic music.” This didn’t please Klaus. This he felt cheapened and debased the music on Cyborg. Cosmic music sounded as if it was the soundtrack to the cheap sci-fi novels of Klaus’ youth. One man who liked the term cosmic music, was Rolf-Ulrich Kaiser, the founder and in house producer of the Ohr label. It was the label that was about to release Cyborg. Soon, Rolf-Ulrich Kaiser had coined the phrase Cosmic Couriers. This was partly a nod to Klaus’ job delivering telegrams. The term Cosmic Couriers didn’t please Klaus, but was used to market this groundbreaking album, Cyborg. It was scheduled for release in autumn 1973. When Cyborg was released in October 1973, the album wasn’t a commercial success. Instead, the album sold in relatively small quantities. It would be much later before Cyborg found a wider audience. That was a great shame, as Cyborg was a genre classic. The sound of traffic opens Conphära, before a drone makes its presence felt. One wonders if this maybe inspired Kraftwerk to make Autobahn? Meanwhile sounds flit in and of the arrangement. It has a mesmeric, motorik sound as it pulsates. Just like on the previous track Klaus has layered instruments and sounds. Klaus uses them like an artist uses a palette, and creates this ambient soundscape. To do this, Klaus combines elements of ambient, avant-garde, Berlin School, experimental and musique concrète are combined with Krautrock. The result is a soundscape that replicates the sound of a city. What sounds like traffic and sirens can be heard . Later, as the drone dominates the arrangement, it sounds as if Klaus is taking the listener on a journey. That’s until the Cosmic Orchestra add a melancholy hue. They play an important role in what’s a pulsating, cinematic epic. Strings are to the fore, while synths and the organ combine. Slowly and gradually, the arrangement begins to reveal its deepest secrets. By then, ambient and cinematic become melodic, futuristic and otherworldly. Much later, the ghostly arrangement pulsates and drones, as motorik and elegiac sounds unite. Together they play their part in what becomes an ethereal, beautiful, dramatic and futuristic. This multi-layered epic invites the listener to let their imagination run riot. If they do, they’ll be richly rewarded, as they wallow in Klaus pioneering the Krautrock and Berlin School sounds. Again, Klaus uses the sound of traffic to open Chromengel. That’s because the listener is about to embark upon a journey, a musical one. There’s a mournful sound as the journey begins. A cello plays, it’s dark, ruminative sound dominating the arrangement. Soon, strings and sci-fi synths are added. The result is captivating and beautiful. Before long, sounds assail the listener. This includes the sound of a helicopter. Mostly, the strings and sci-fi synths take centre-stage, creating a beautiful, but mournful sound. Sometimes, it’s futuristic and otherworldly, while other times it’s elegiac and ethereal. Resistance is impossible as this sci-fi symphony unfolds. Later, the strings disappear, and the arrangement features just the sci-fi sounds. Klais unleashes washes of eerie, otherworldly sounds that encircle and assaie the listener. This is Klaus Schulze at his most innovative, as this sci-fi symphony takes an unexpected twist, before it reaches a crescendo. Neuronengesang closes Cyborg. There’s an element of darkness and drama as the arrangement decides to share its secrets. A drone dominates the arrangement, while sci-fi, space invader synths beep and squeak. Meanwhile, distant strings add a wistful hue. By then, the dark drone sounds like a ship sending out a warning in a storm. Already sounds assail the listener, and the cinematic sound taunts the listener, daring them to let their imagination run riot. As they conjure up scenarios, drones dominate the arrangement. They’re joined by futuristic, Star Wars synths. Later, it’s all change as the arrangement takes on an ethereal sound. Still, the synths beep and squeak. They’re then joined by the melancholy sound of the organ and elegiac sounds. Just like previous tracks, instruments and sounds flit in and out, adding to a track that’s variously symphonic, experimental and futuristic. There’s also darkness and drama. Beauty, melancholy and otherworldly sounds also visit, as the arrangement meanders, drones and pulsates. Always though, continues to captivate and compel as one would expect of an innovator like Klaus Schulze. He had just released a genre classic. Cyborg which was recently remastered and reissued by MIG. Sadly, although many critics recognised that Cyborg was an important, innovative and influential album, it passed most record buyers by. Especially in Klaus’ native Germany, where he was one of a new wave of musicians who were writing a new chapter in the country’s musical history. It was only later that most German’s discovered the music of the Berlin School and Krautrock. 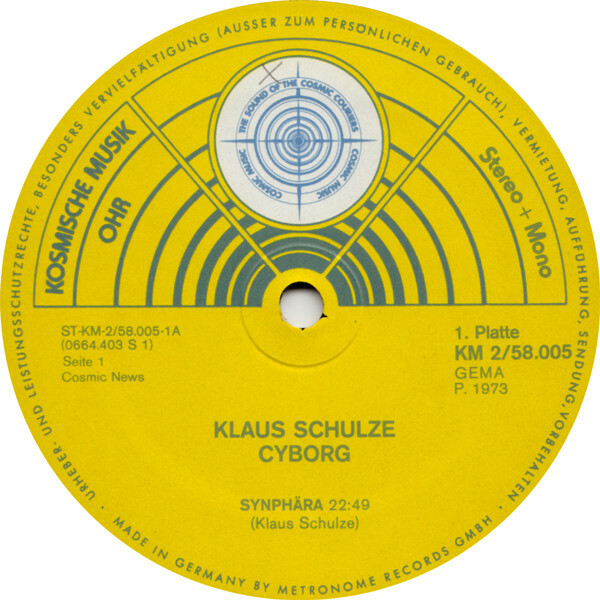 Cyborg, 1973 Klaus Schulze’s sophomore album was later regarded as a Berlin School classic. 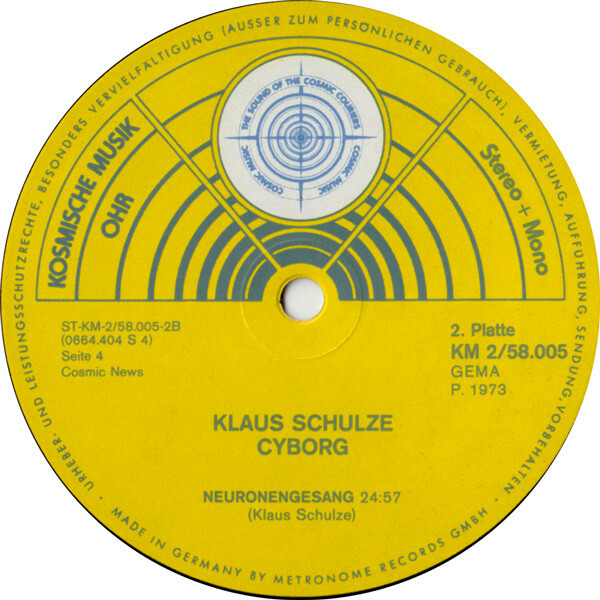 However, Cyborg also references Krautrock, plus ambient, avant-garde, drone, experimental and musique concrète. This genre-melting album features Klaus Schulze at his innovative best. He pushes musical boundaries to their limits, and sometimes way beyond. To do this, Klaus used his various modified musical instruments and his excerpts from his tapes from Colluquim Musica Orchestra. These tapes added “spice” to this captivating genre classic. Cyborg featured four cinematic epics. They variously understated, broody, moody, dark, dramatic and gothic. Other times, the music is futuristic and full of otherworldly and sci-fi sounds. Sometimes, though, the music is beautiful, elegiac and ethereal. Occasionally, the music is eerie, mesmeric and ruminative. Always, Cyborg has a cinematic sound. The same could be said of Klaus Schulze’s debut solo album Irrlicht. Both features cinematic, multilayered soundscapes. They are full of nuances, subtleties and surprises aplenty. 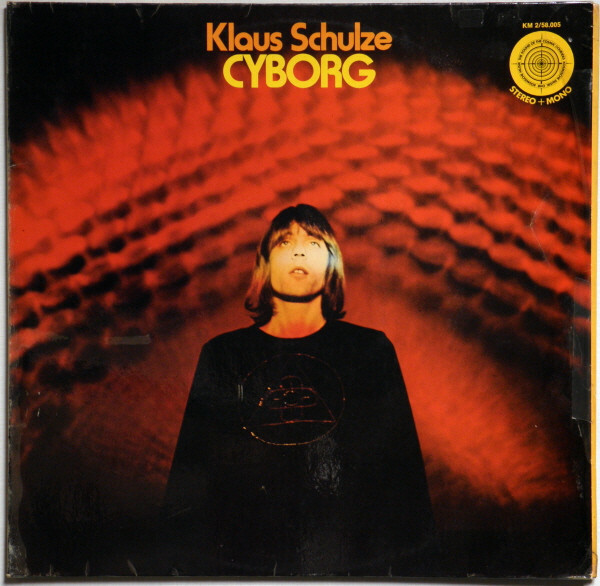 The result is Cyborg, an epic cinematic space symphony, which features musical maverick Klaus Schulze at his innovative best on a timeless genre classic. ← THE BLUE NILE-THEY COULD AND SHOULD’VE BEEN GIANTS. I’m also a big fan of Klaus Sculze and Cyborg in particular. Great album. Do you know the ‘La Vie Electronique’ CD series? Fascinating archival releases.